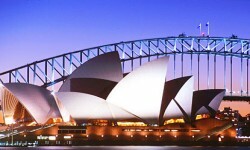 Located in New South Wales, Sydney is the largest Australian city with a population of approximately 4 million people. The city of Sydney is located on the south-eastern coast of Australia and lies between the smaller coastal cities of Wollongong and Newcastle. One of Australia’s most popular tourist destinations, Sydney city is home to a wide array of exciting attractions and plays host to an abundance of high profile events each year. With attractions as far as the eye can see in every corner of Sydney there will never be a boring moment on your Sydney holiday. Experience the iconic Sydney Opera House and the Sydney Harbour Bridge that have put Sydney on the map throughout the world. Or take a trip back to nature and visit one of Sydney’s many parks and gardens. Visit the famous Luna Park on the shores of Sydney Harbour or see the city from the water and travel by city cat or boat. If shopping is your forte, in Sydney you can experience shopping that is unlike any other in Australia, with shops dominating much of the city you will find everything ranging from department stores, vintage shops, boutiques, outlet centres and markets. Events throughout the city of Sydney are always prolific and are often attended and watched by people all over Australia. The home of entertainment and glitz and glam Sydney hosts it all. From a huge range of music and cultural festivals, to rugby league Grand Finals and the famous Sydney to Hobart yacht race. There is always something happening – so check it out the Calendar of Events and why not see what’s happening when you visit on your Sydney holidays. The bustling city of Sydney is a chic and stylish holiday destination and definitely has something to offer every holidaymaker. Modern yet rich in history the city is jam-packed with contrasts that are evident as you explore the city. Sydney accommodation ranges from comfortable backpacker and youth hostel styles to modern indulgent luxury and affordable comfort – whatever your budget and whatever your idea of the perfect holiday – Sydney is the perfect destination for your New South Wales holiday!